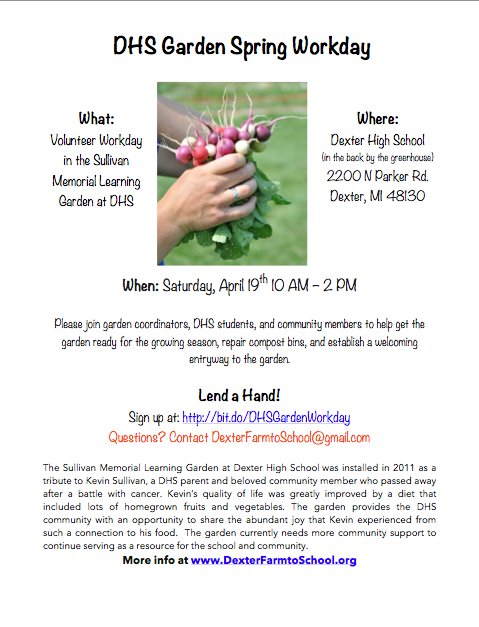 Volunteers are needed for the DHS Garden Spring Workday on April 19th from 10:00 am – 2:00 pm. Please join us, DHS students, and community members to help get the garden ready for the growing season, repair the compost bins, and establish a welcoming entryway to the garden. Find more details and Sign up here or at: http://bit.do/DHSGardenWorkday. If you can’t stay the whole time, no problem! Just come when you can. We hope to have food at the event both donated by local businesses and contributed by volunteers. If you are able to bring food, please let us know by emailing us at DexterFarmtoSchool@gmail.com. Also, if you have tools that might be useful such as a rototiller, extra shovels and rakes, or extra compost and mulch please let us know! Many hands make light work! Join us!